Lu Flux is a delightfully playful and eccentric women’s wear collection based on British eccentricity, and a love of traditional techniques combined with modern design. Working with complex pleating, knitting and patchwork, the company playfully combined one off fabric finds. Working predominately with salvaged and vintage materials rescued from textile recycling plants, as much for access to the quirky undervalued fabrics they favor, as for the sustainable benefit, Lu Flux also utilize British made, end of line materials that would otherwise go to waste. 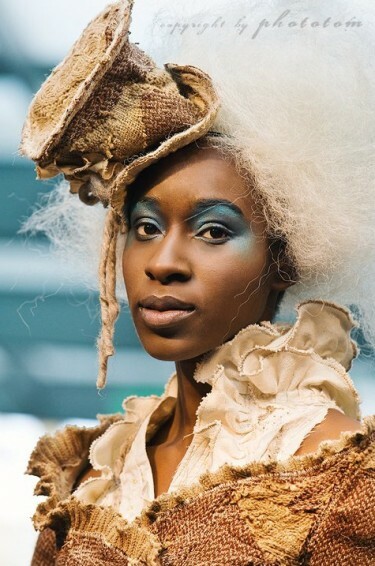 Originally from the Isle of Wight, Lu studied design in Edinburgh College of Art, as well as assisted Bernhard Willhelm in Paris. 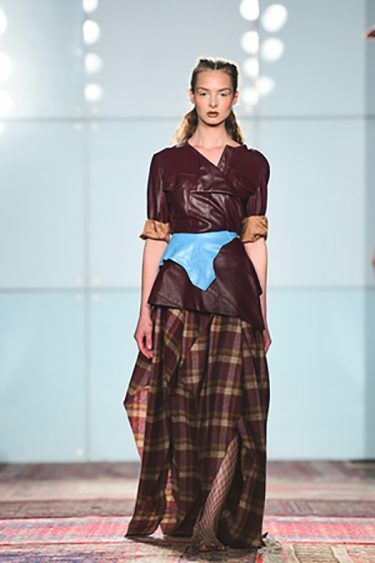 Showing at London’s eco conscious trade show Estethica, the brand was awarded the Innovation Award in conjunction with the Ethical Fashion Forum, as well as highlighted as ‘Ones to Watch’ in their February 2009 debut at Vauxhall Fashion Scouts. Lu Flux simply couldn’t be anything but English; their eccentric flights of fancy are intrinsically British. 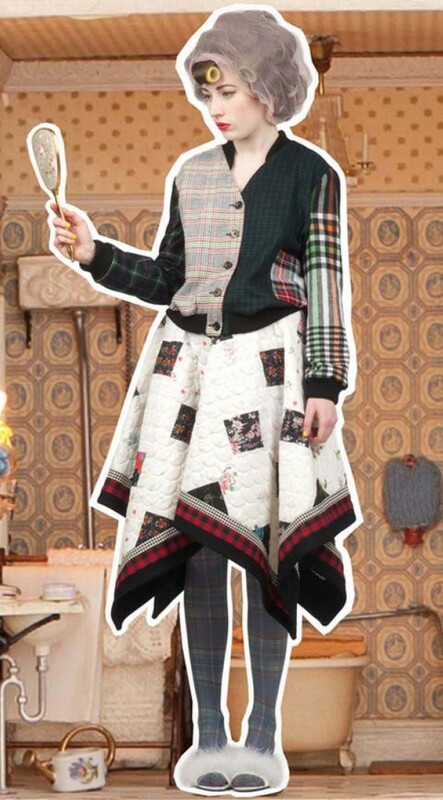 Their collection is the ubiquitous English, stop motion children’s television program, Magic Roundabout come to life, with jackets pieced together from your grandfathers sweater vest collection and skirts made from your favorite childhood duvet. 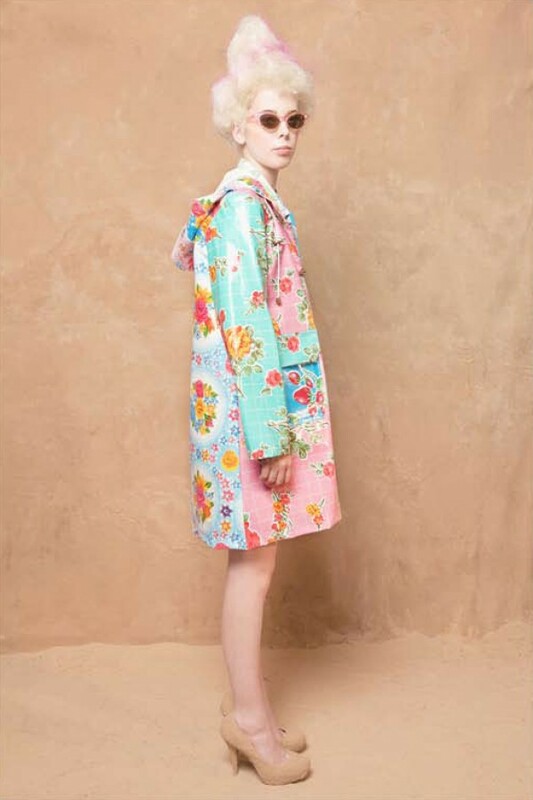 The insanity of the print and pattern mix adds to the charm of the collection, which is truly a dreamlike adventure, scattered with childhood memories and cultural metaphors. This is a clothing line surely made for Alice Horton, the dippy blonde from The Vicar of Dibley, who still believes in the tooth fairy, the Easter bunny and Father Christmas, using the curler laden head of iconic English washerwoman, Nora Batty from Last of the Summer Wine, as a style icon. This is a clothing line surely made for Alice, where a childlike dream world full of color and pattern collides with reality to brighten and color our waking moments. The collection features iconic items, with oven mittens paired with a floral housecoat muumuu to make a wonderfully mad scarf, where a curtain pelmet becomes the trim to a jacket, and a kitsch holiday dishcloth adorned with vacation memories is refashioned into a skirt, and all the most unfashionable codes are made somehow cute and cool. A twisted Universe where sophistication and minimalism is boring, and playfulness is revered. Lu Flux repertoire of materials include iconic, dated, unfashionable items such as a floral housecoats, grandfather tweed jacket, maternal bedside rugs, and childhood quilts, mixed together Willy Wonky style and coming out the other end of some insane machine, fully formed and totally mad. It is impossible not the love this collection, its naive charm totally wins you over, and whether you would wear it or not you cant help but smile just looking at it. The lunacy continues throughout all Lu Flux do, with models cut and paste into the quaint and over crowded world of a dolls house, and designs named the ‘Bricklayer Waistcoat’, the ‘Chore Blouse’ and the ‘Rooftop Leggings’, a collection laden with cultural codes and meaning, carefully cultivated over seasons, each season seeing a marked development in their very personal sense of style. Collections are aptly named ‘A-Lu-Ha’ or ‘Everything But the Kitchen Sink’, and can be bought direct from the Lu Flux website or through a range of retailers from London to Australia and Japan. 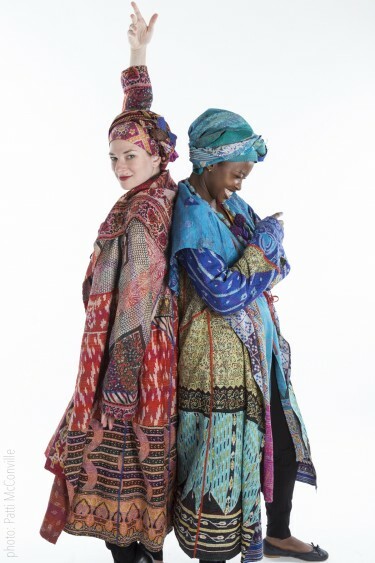 Mieko Mintz signature collection of jackets is produced from a dizzying array of vintage sari kantha quilts. 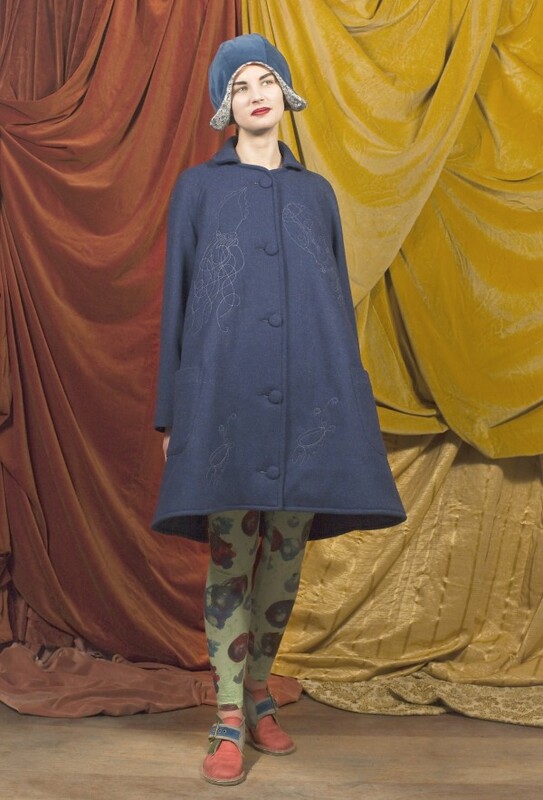 Raggedy is a Welsh based label that creates recycled women’s clothing, by combining knitwear, tweeds, linens and cotton into new incarnations of unique quirky couture times. Mei Hui Liu, the founder of Victim Fashion Street, has a street rebels eye for recycled materials. Her naïve punk approach to recycled fashion is her signature style, with a ten-year heritage. Angela Johnson is an Arizona based indie designer who handcrafts quirky, playful, tongue in cheek dresses from recycled fabrications. 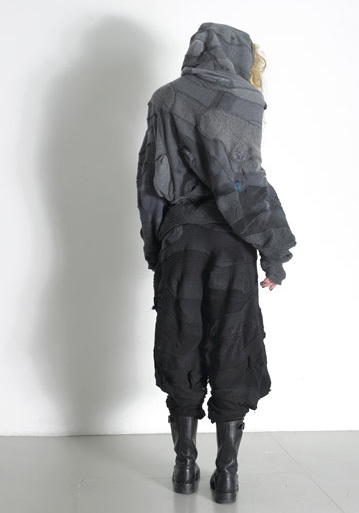 Steinwidder is an Austrian label founded in 2002 by Anita Steinwidder, and working with pre and post consumer waste to produce an authentic, unique and creative women’s wear collection. Schmidttakahashi is a Berlin based label that specializes in upcycled and restyled, redesigned clothing. 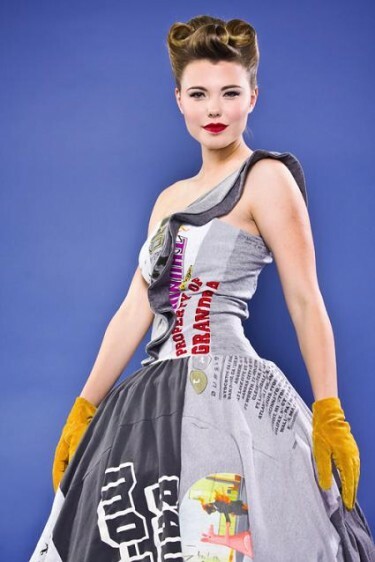 Simona Lampe designs an upcycled womenswear collection as a means of spreading awareness about waste. Preloved creates one-of-a-kind clothing from reclaimed and vintage fabrics. With fit, comfort and style acting as their driving force, the collection is trend conscious but wearable, with a broad range of items including dresses and separates.